In a divided country desperate for unity, two sons of South Carolina show how different races, life experiences, and pathways can lead to a deep friendship—even in a state that was rocked to its core by the 2015 Charleston church shooting. Tim Scott, an African-American US senator, and Trey Gowdy, a white US congressman, won’t allow racial lines to divide them. They work together, eat meals together, campaign together, and make decisions together. Yet in the fall of 2010—as two brand-new members of the US House of Representatives—they did not even know each other. Their story as politicians and friends began the moment they met and is a model for others seeking true reconciliation. 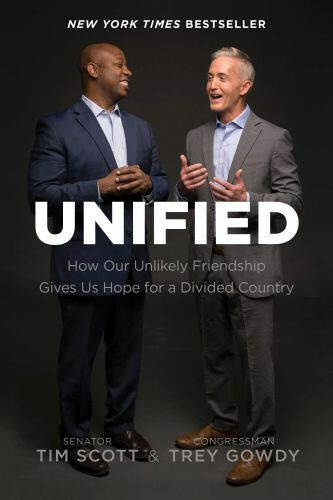 In Unified, Senator Scott and Congressman Gowdy, through honesty and vulnerability, inspire others to evaluate their own stories, clean the slate, and extend a hand of friendship that can change your churches, communities, and the world. Bibles At Cost offers the Best Selling Bibles at the Lowest Prices in America. Not only do we sell Bibles by the case lot, our low prices are available in individual quantities as well. Save up to 40%-70% on evangelism and Scripture tools. The lower the price, the more Bibles into hands - that's our goal. We can help find the right tools for your Ministry needs. Prices include shipping, only $5.95 handling per order. © 2016 Bibles At Cost. All Rights Reserved.